Blogging was suspended as we moved home to the gorgeous Australian country town of Castlemaine. 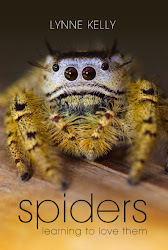 It is wonderful to be sharing my love of spiders again. The end of the twelve year drought brought solid rains to Victoria. One noticeable change was the proliferation of Golden Orb Weavers, Nephila edulis. A large elegant orb weaver, mature females have a body length of well over 20 mm. We had a few at the old home near Hurstbridge. One was outside the shed I used as my author's den, my Garret. As my first golden orb weaver to watch up close, I named her 'Precious'. She constantly grew, shedding her skin and leaving it for show. The skin is to the right, left dangling in her web. By the next day, she had disentangled it and let it drop. She had split the carapace (the top of her front section, the cephalothorax) so the grey bit is above the rest of the shed skin. She had then extracted herself - long legs and all - leaving only the shell. I was very sorry to leave her. I arrived in Castlemaine to find a new Nephila right outside the window of the living room where I sit for breakfast every day. I named her 'Welcome' because I could not have had a better welcome to our new home. A week later and one morning she was not in her regular spot. I was delighted when, after 24 hours away, she returned. Hunting around, I found the cause of her absence. She'd created a stunning golden egg sac in the foliage of the ivy pelargonium on the edge of her web. After a severe frost - a new experience for me - I rushed to check Welcome and she was hanging in the web horizontally. I was sure that I had lost her but, gradually, during the day she recovered. The location she had chosen gets no direct sun at all, south facing and always shaded by the house. A few days later, and an even more extreme frost, she was once again hanging in her web. This time she didn't recover. The next day she was gone. I couldn't find her body. The web was not damaged, so I guess it wasn't a bird gathering fresh dinner. I can only assume that she dropped into the foliage below. I couldn't see her body but didn't want to destroy her web by a search. The web gets covered with dew and still looks stunning in the mornings. The Nephila in the forest have fared much better. Nearby is Kalimna Park, a 175 hectare bushland reserve, part of the Castlemaine Diggings National Heritage Park. The forest probably reduces the impact of the frosts on the spiders. Or maybe they haven't made their egg sacs yet and aren't ready to die. I am monitoring five Nephila, four in a group and one on a massive web nearby. All my Kalimna spiders will have a K in their names. Four of my five Nephila-Ks are adults and have tiny males in attendance. Nephila-K-Top, like the other three adults, has a male in attendance. As I watched, he was strumming the web and she was responding with taps on the silken lines. Over the half hour I was there, they had not advanced past strumming. If he does mate with her, he will almost certainly be eaten. The males of most spider species tend to leave unscathed. Nephila males aren't so lucky. K-Large also has a male moving in for the act. I will let you know how K-Large, K-Medium, K-Top and K-Littley survive. K-Massive-web is just up the road from them and has the largest web I've seen for a Nephila. Only a ten minute walk from home, I'll be checking them daily. But there are lots of other spiders around, even in the middle of winter. I'll be blogging them and the creatures in their environment - those which eat them, those they eat and those who just share their space.